As we discovered last night, the older of our two cats, Echo (pictured in a pizza box above), may have a problem. We think he is addicted to catnip. This would be largely my fault. He tends to be very hyper in the middle of the night and, as a way of calming him down (so my wife and I can get some sleep), I've been rubbing catnip in his fur. Not a lot, just enough to help him relax a bit. Well, he ran out a couple days ago and I finally had a chance to pick up a new bag for him yesterday evening. He didn't even let us give it to him. 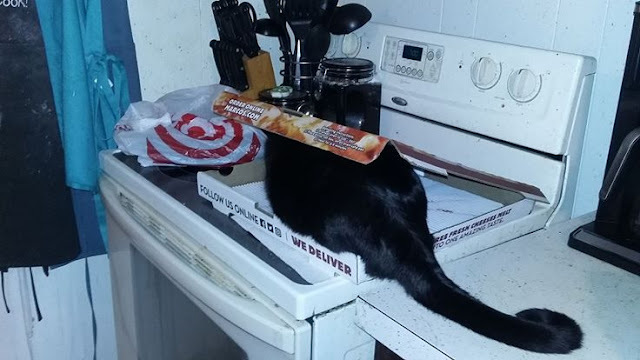 The unopened bag was on the kitchen table for maybe three minutes before he was up there trying to open it. Then, when my wife tried to take it away from him, he wrapped his paws around it and fought her. After we finally gave him some of it, we learned it wasn't enough. I had placed the bag on top of our pantry out of reach (or so I thought) and he found a way to climb up on the refrigerator so he could try to get it. I chased him down a couple times and, after he finally settled down a bit, thought it was no longer an issue. However, I got up this morning and found he had, once again, gotten up there and knocked the bag to the ground (along with everything else that was up there). I ultimately had to lock up the bag of catnip in our medicine cabinet. It's on the top shelf as far out of reach as I possibly can get it. I just hope he leaves it alone because he's kind of heavy and, if he gets up there, he's probably going to rip the whole thing off the wall. I wonder if they offer drug rehab for cats.